Contrasting colors call attention, and that’s why this surveyor vest is great when you want to remain visible in a work zone. 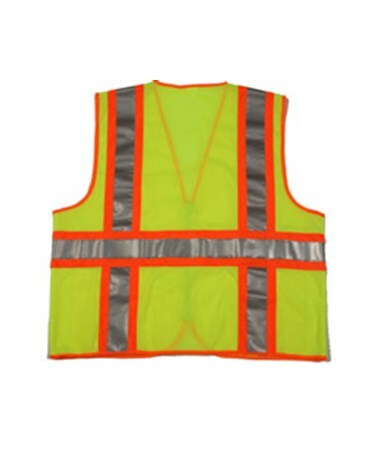 The safety vest is of a fluorescent yellow-green color, with a contrasting orange-red reflective underlay and edge binding. 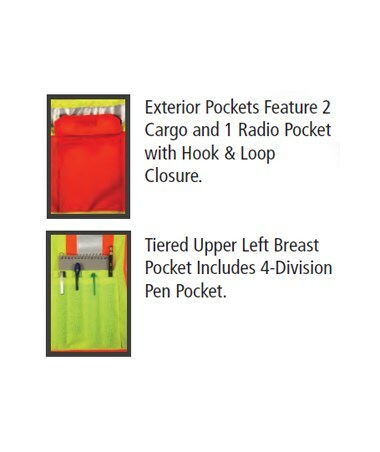 The fluorescent colors and reflective tape are ANSI/ISEA 107 Class 2, Level 2 compliant. 2” reflective tape is sewn to the vest and placed in an “H” pattern. 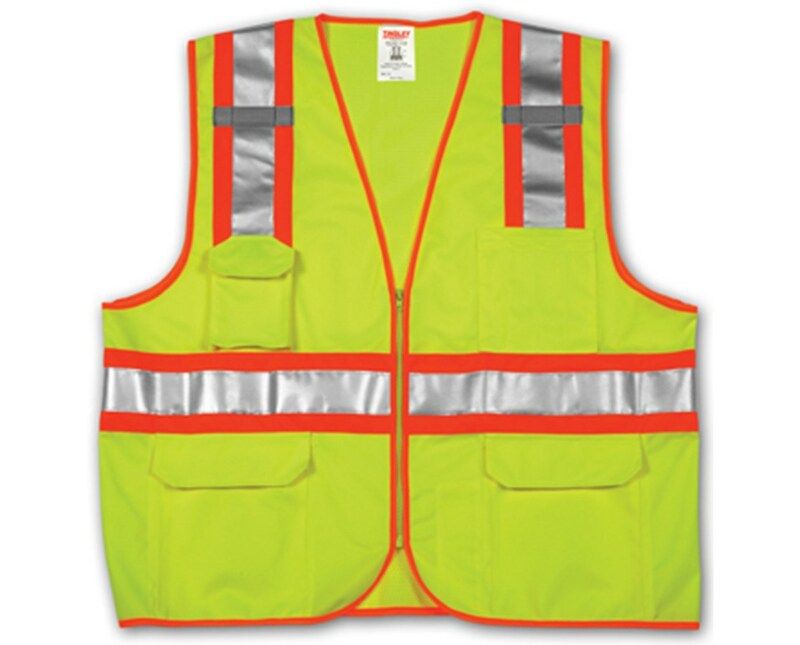 The combination of two tone fluorescent colors and the reflective tape, ensure that you remain visible to oncoming traffic and fellow co-workers on a jobsite. Durable and comfortable materials were chosen for this vest. The front of the vest is made of a solid polyester material to support the large amount of pockets that the vest boasts. The back is of a mesh material that allows the body to breathe, providing a more pleasant work atmosphere. The surveyor vest is machine washable and features a zipper closure, which allows for and easy on and off of the vest. The vest boasts 8 pockets, 3 interior and 5 exterior. The lower right and lower left interior pockets are the same size and measure 6.75” X8”. Additionally, a pen pocket measuring 5.5” X 1.75” is placed near the lower left pocket. On the exterior of the vest below the vertical reflective strips are three pockets. A cell phone / radio pocket with a flap closure is on the upper right, measuring 4.5” X 3.75”. On the left side of the vest is a four section pen pocket, measuring 5.5” X 5.5”. Beneath the pen pocket is another pocket, measuring 5.5” X 6”. Two large pockets with flap closures are located on the lower right and left sides, measuring 7.5” X 8.5”. Two grey mic. tabs are featured on the vest, they are situated a little below the shoulders. This vest is available in sizes; S-M, L-XL, 2X-3X and 4X-5X. Click here to view a size chart. 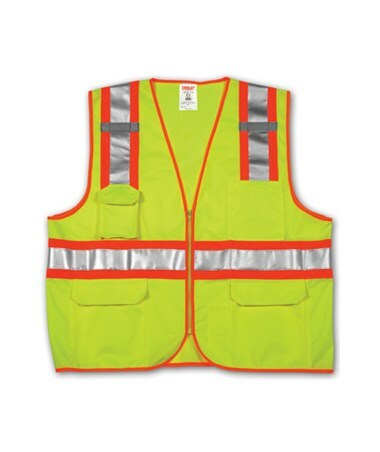 The bright contrasting two tone color and the reflective strips on this vest, will keep you visible to everyone around you. Order yours today.